"3 x 4" can mean "Take your 3x growth and make it 4x larger, to get 12x"
Add vectors: Accumulate the growth contained in several vectors. Multiply by a constant: Make an existing vector stronger (in the same direction). Dot product: Apply the directional growth of one vector to another. The result is how much stronger we've made the original vector (positive, negative, or zero). 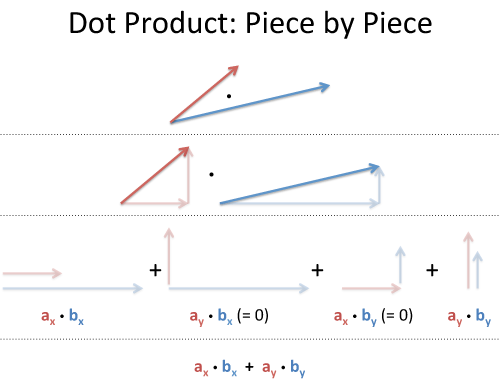 Today we'll build our intuition for how the dot product works. And also the justification: "Well Billy, the Law of Cosines (you remember that, don't you?) says the following calculations are the same, so they are." Not good enough -- it doesn't click! Beyond the computation, what does it mean? The "this stuff = that stuff" equation just means "Here are two equivalent ways to 'directionally multiply' vectors". The number 3 is "directional growth" in a single dimension (the x-axis, let's say), and 4 is "directional growth" in that same direction. 3 x 4 = 12 means we get 12x growth in a single dimension. Ok.
Now, suppose 3 and 4 refer to different dimensions. Let's say 3 means "triple your bananas" (x-axis) and 4 means "quadruple your oranges" (y-axis). Now they're not the same type of number: what happens when apply growth (use the dot product) in our "bananas, oranges" universe? (3,0) means "Triple your bananas, destroy your oranges"
(0,4) means "Destroy your bananas, quadruple your oranges"
Applying (0,4) to (3,0) means "Destroy your banana growth, quadruple your orange growth". But (3, 0) had no orange growth to begin with, so the net result is 0 ("Destroy all your fruit, buddy"). See how we're "applying" and not simply adding? With regular addition, we smush the vectors together: (3,0) + (0, 4) = (3, 4) [a vector which triples your oranges and quadruples your bananas]. "Application" is different. We're mutating the original vector based on the rules of the second. And the rules of (0, 4) are "Destroy your banana growth, and quadruple your orange growth." When applied to something with only bananas, like (3, 0), we're left with nothing. The word "projection" is so sterile: I prefer "along the path". How much energy is actually going in our original direction? Take two vectors, a and b. Rotate our coordinates so b is horizontal: it becomes (|b|, 0), and everything is on this new x-axis. What's the dot product now? (It shouldn't change just because we tilted our head). One vector are solar rays, the other is where the solar panel is pointing (yes, yes, the normal vector). Larger numbers mean stronger rays or a larger panel. How much energy is absorbed? 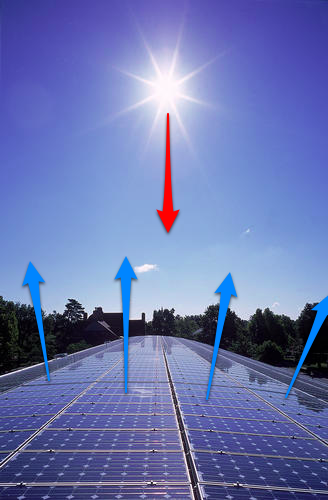 If you hold your panel sideways to the sun, no rays hit (cos(θ) = 0). But... but... solar rays are leaving the sun, and the panel is facing the sun, and the dot product is negative when vectors are opposed! Take a deep breath, and remember the goal is to embrace the analogy (besides, physicists lose track of negative signs all the time). 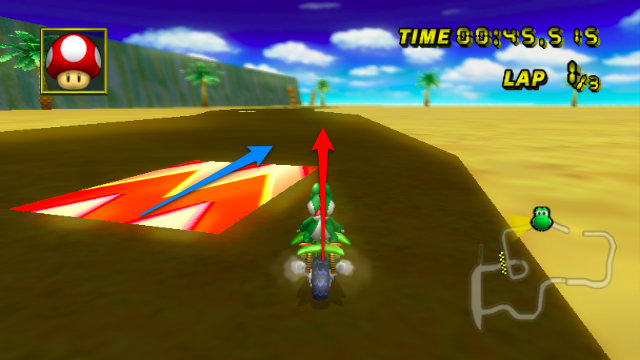 Imagine the red vector is your speed (x and y direction), and the blue vector is the orientation of the boost pad (x and y direction). Larger numbers are more power. Neat, eh? Another way to see it: your incoming speed is |a|, and the max boost is |b|. The amount of boost you actually get (for being lined up with it) is $\cos(\theta)$, for the total $|a||b|\cos(\theta)$. The dot product appears all over physics: some field (electric, gravitational) is pulling on some particle. We'd love to multiply, and we could if everything were lined up. But that's never the case, so we take the dot product to account for potential differences in direction. It's all a useful generalization: Integrals are "multiplication, taking changes into account" and the dot product is "multiplication, taking direction into account". And what if your direction is changing? Why, take the integral of the dot product, of course! 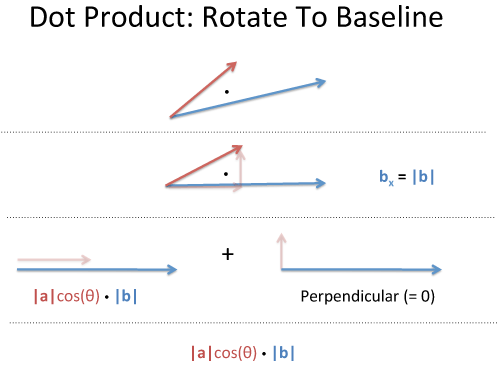 Don't settle for "Dot product is the geometric projection, justified by the law of cosines". Find the analogies that click for you! Happy math.